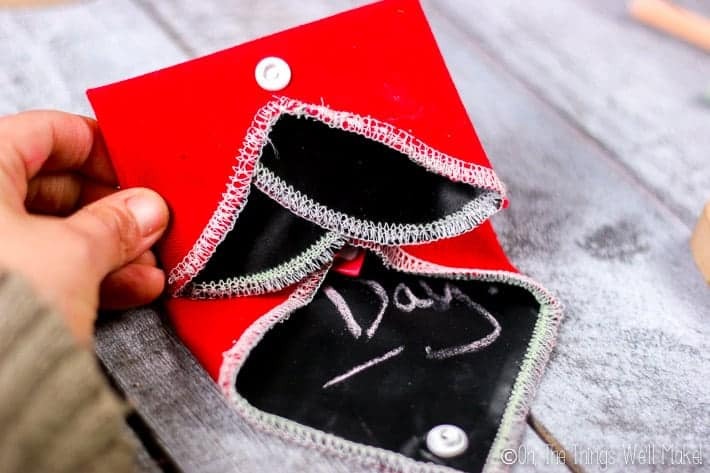 Portable, Foldable Chalkboard Heart - The Perfect Valentine! - Oh, The Things We'll Make! 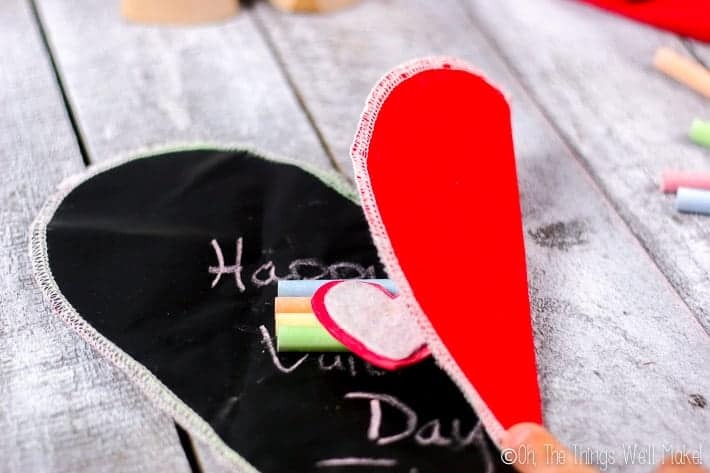 You are here: Home / Make it Yourself / Arts & Crafts / Portable, Foldable Chalkboard Heart – The Perfect Valentine! 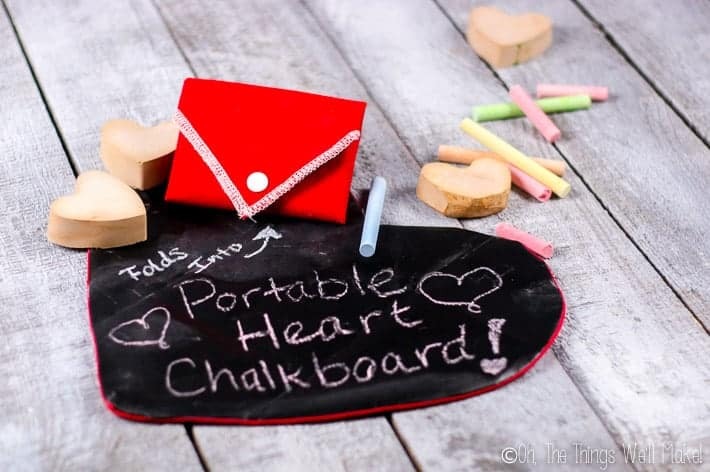 Kids will love this portable, foldable chalkboard heart. It's the perfect Valentine for your favorite little artist! The other day I was playing with making my own sidewalk chalk. Because we're nearing Valentine's Day, I couldn't help but make the chalk into a heart shape. While I was working on making and playing with the heart-shaped sidewalk chalk, it dawned on me. 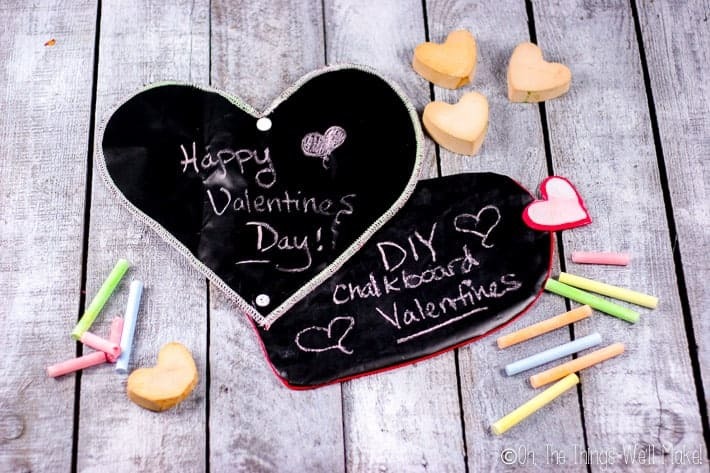 Wouldn't it be great to make a Valentine's Day chalkboard? Something that kids could use inside and draw and erase, and play with over and over again. After a bit of planning, I decided that I would try making a cloth chalkboard because I figured I could more easily make a more portable chalkboard for kids with cloth: something that can be brought with them from place to place without taking up a lot of space. After a bit of planning, I saw some foldable Valentines online. 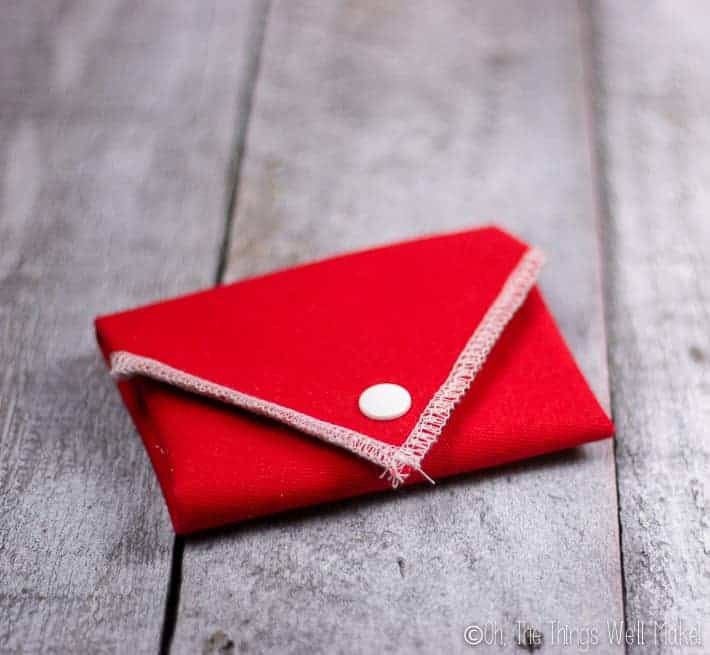 They were paper hearts that folded into what looked like a cute little envelope. I decided to use the idea, adapting it to make it from chalkboard fabric. When you fold it up, you can even store some chalk and a small eraser inside. You can fold the heart over the chalk and eraser for easy carrying. 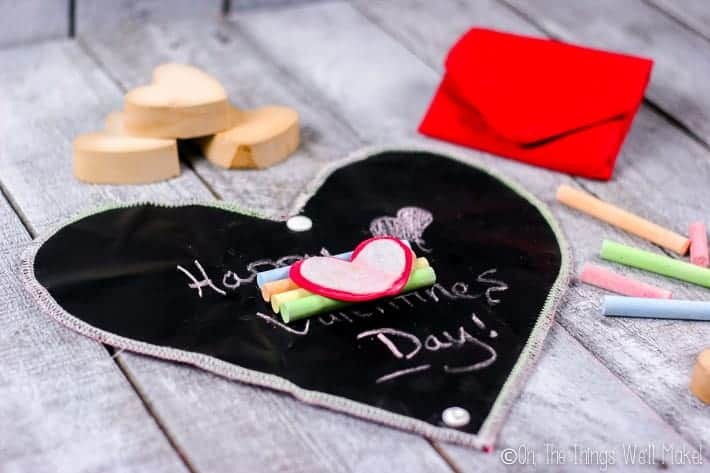 To make the cloth chalkboard, I'm using the method that I used to make the sandwich wraps that I showed you a few months ago, except this time instead of a square, it's slightly trickier to sew because it's in a heart shape for Valentine's Day. First, you'll want to make a pattern. I made mine by cutting a heart out of wrapping paper. I then played with the size of it until I found the perfect size for wrapping up a few sticks of chalk inside. 2. Cut two hearts out of fabric. 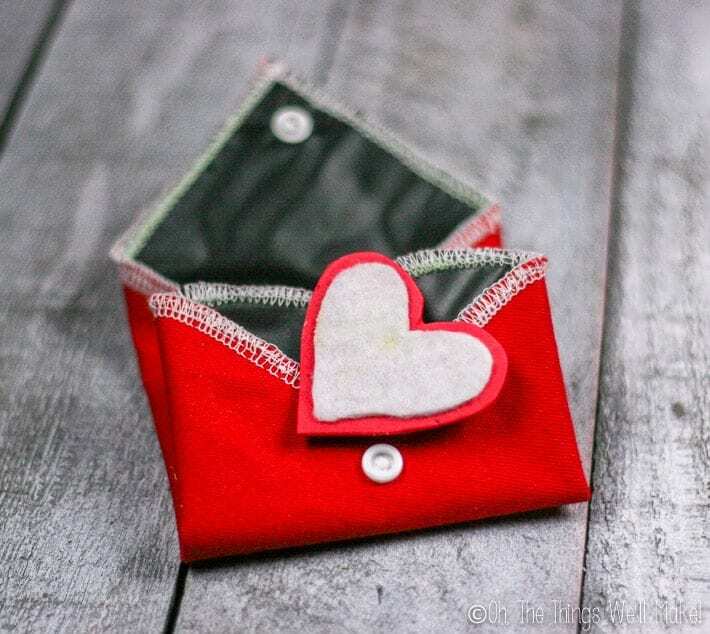 Once you've cut your pattern to the size heart that you want to use, you'll need to cut two hearts out, one out of chalkboard fabric, and the other out of whatever fabric you want on the outside. Here you can see the general idea of how it gets folded up into what looks like an envelope. 3. Sew together your 2 fabric hearts. To sew it up, there are two ways of doing it. If you have a serger, the easiest way is probably to put the two cloth hearts together, right sides out, and serge around the outside border of them. I will have to say that it was tricky sewing together the fabric at the point in the top center with my particular serger, but if you make the point less pronounced, it would be easier to sew that area. I ended up had touching mine up with a finishing seam on my regular sewing machine when I was finished. If you don't have a serger, you can still make this pretty easily by putting the two heart fabrics together, right sides facing each other this time. You then sew around the edges, leaving a small space to flip your heart right-side-out afterward. I would recommend leaving your space along one of the straight sides of the heart, rather than at the top where it's curvy. That makes it easier to close the seam up later on. Once you flip the fabric right side out, you'll need to sew up the open space in the seam. I usually do that by sewing all the way around the edge of the entire project, very near the edge. If you fold the edges of the fabric under at the open part, they'll get caught into the seam, and you'll close it up quite easily and attractively. If you do it correctly, it is closed up in a way that looks similar to the rest of the seam. Heart chalkboard made with a serger above a heart chalkboard made with a regular sewing machine. I started to make another one that way, with my sewing machine, to make sure that it would work out well. I was in a hurry and didn't finish it with the seam running all the way around the outside, but you can get an idea of how the seams look in the sewing machine version in the picture above. One thing you want to keep in mind when working with the different chalkboard fabrics is that you want to be careful with where you use pins, if you use them, because they can leave a permanent mark. I tend to use clothespins to keep everything together anyway, so that wasn't a problem for me. Also, depending upon the chalkboard fabric you use, an iron may melt it. So, just try using your hands to smooth everything out as best as you can. It tends to hold its shape pretty well anyway. To finish off the project, I decided to make a little heart eraser using craft foam and felt. The eraser was made from a felt heart glued onto a craft foam heart. All I did was to cut a small heart out of felt, and then glued it onto a slightly bigger heart that I cut out of craft foam. Just like with the sewn sandwich wraps, you can make your closure with either an elastic band or some plastic snaps. I had bought a lot of plastic snaps for other projects a while back and found those to be the quickest, easiest way for me. Plus, they look pretty darn cute, don't you think? To calculate where I needed to add the snap, I just folded up my chalkboard heart and marked where I thought the ideal place would be for my snap and placed it there. Once your snap is in place, you are all set. 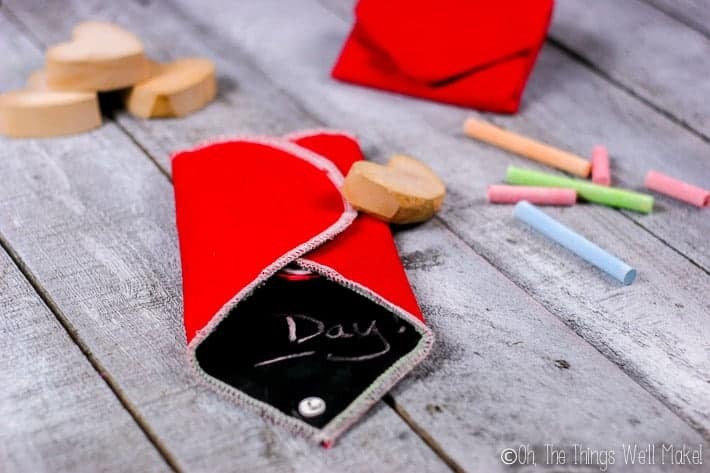 You can wrap up some pieces of chalk, the little heart eraser, and snap it all together for your favorite little Valentine. I hope they love it! 1. Fold both sides of the chalkboard heart over the chalk and eraser in the center. 2. Fold the top part of the heart over the center portion. 3. Fold the bottom point up over the center and snap it together. 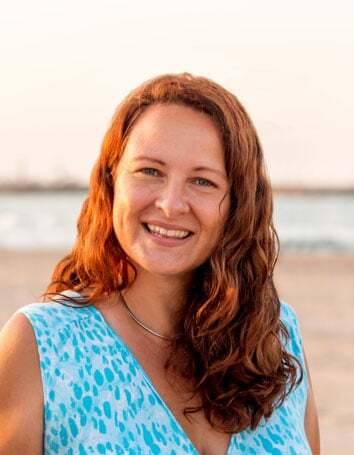 If you have enjoyed this post, I would love it if you would share it with your friends. These look really cute! My daughters and their friends would love them. This is adorable! What a cute and creative idea!